SUNNYVALE, Calif. - Dec. 1, 2016 - PRLog -- Steve Davis has much to say and through his music, he touches the hearts and minds of those that experience his special brand of lyrical storytelling. Don Powell (former manager of Stevie Wonder, David Bowie) commented on the talents of Steve & his music: "Steve's songs have the unique quality of combining pleasing melodies with strong lyrics. His voice has the subtle sound of many popular singers such as Bryan Adams, Don Henley, Paul Simon, Jackson Browne and The Eagles." 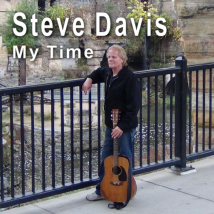 Steve has been writing, recording & performing in Minnesota for over 20 years. Steve has written over 500 songs and has produced many with videos that visually add to his stories that are told through music.